In any part of Kerry if you keep your ear to the ground you should uncover a good traditional ‘session’. The session can be a bit hard to pin down. Venue, date and time may be a matter of probability rather than anything definite. But if you get a reliable hint, get to the pub early if you want a seat. It´ll start with maybe a fiddle and tin whistle trying a few tentative notes in a corner before collecting their pints which are settling on the bar. Order a few for yourself while you have the chance. If its a good night, the pub will be packed and you will be drunk on a wild, strange, bitter-sweet music, belted out by two musicians who have mysteriously become ten, and the bar man is trying to throw you out!. 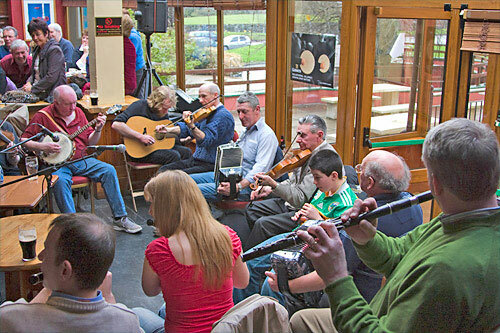 One of the most popular traditional music instruments in Kerry is the bodhran. It was ideally suited to a people who didn’t always have the money to buy musical instruments but who had the time and the skill to make them. The bodhrón is made by stretching the skin of a goat over a circular wooden frame. It is cured, stretched, and attached in a method that goes back centuries. The old way of curing the skin was to hang it in the smokey atmosphere of a chimney, high up, away from the heat. The curing properties gave it a long life that insured it kept the music hopping in more than one generation of Irish kitchen dances. They are not expensive to buy and are a beautiful souvenir that will give years of fun and enjoyment. A new dance craze is sweeping Ireland. Did I say new? It started well over a hundred years ago, when dances called quadrilles met and mingled with Irish dance steps and tunes, and set dancing was born. A first cousin of American square dancing, set dancing flourished all over Ireland, with each district having its own special dances and its own particular style. Traditionally, sets were danced when neighbours gathered in farmhouse kitchens – hence the phrase ´around the house and mind the dresser!´ Nowadays, there is a big set-dancing revival among Irish people of all ages in cities, towns and villages. Why not try it yourself? When in Kerry don’t miss Siamsa Tire (National Folk Theatre) in Tralee.